James Blaine was born in West Brownsville, Pennsylvania, was born on 31st January, 1830. After graduating from Washington College in 1847 he taught at the Western Military Institute and the Pennsylvania Institution for the Blind (1852-54). In 1854 he moved to Maine where he edited the Portland Advertiser and the Kennebec Journal. 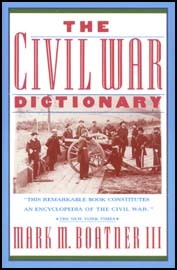 A member of the Republican Party he was elected to the 38th Congress and took his seat in March, 1863. A supporter of African American suffrage, Blaine was a strong opponent of President Andrew Johnson and voted for his impeachment in 1868. Blaine soon built up a loyal following in the House of Representatives and in 1868 he was elected speaker. Blaine was an unsuccessful candidate for presidential nomination in 1876 and 1880. James Garfield, who was the successful Republican Party candidate, appointed Blaine as his Secretary of State. However, when Garfield was assassinated, Blaine resigned as he was unwilling to serve under Chester Arthur. In 1884 Blaine at last won the Republican Party presidential nomination. His campaign was not helped by Bernhard Gilliam, the cartoonist with the magazine, The Judge. 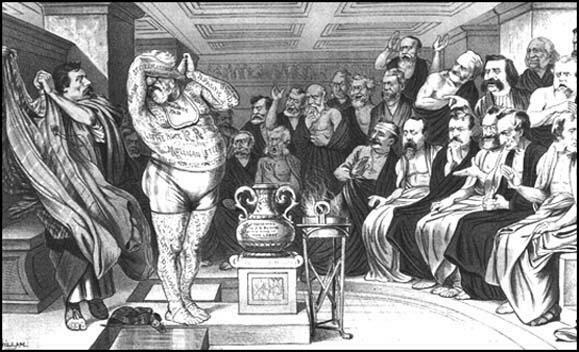 In these cartoons, Blaine's body was engraved with details of charges of corruption made by his political past. Blaine threatened to sue but was persuaded by his political friends to back down. In the election Blaine was narrowly defeated by the Democratic Party candidate, Grover Cleveland by 4,911,017 to 4,848,334. When Benjamin Harrison defeated Grover Cleveland in 1888 he appointed Blaine as his Secretary of State. He held the post until retiring in June, 1892, as a result of poor health. James Blaine died in Washington on 27th January, 1893.